EZ Up shade canopy tents and Quik Shade instant canopies offer instant protection from the sun to shade you and your family. 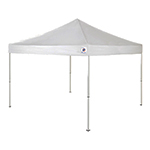 We carry all of the most popular canopy shade tents like the E-Z Up Envoy 10' x 10' straight leg canopy and EZ Up Swift slant leg shade canopy. Our pop up shade structures have open cathedral ceilings providing more headroom. 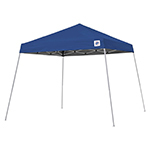 E-Z Up Quik Shade canopies are perfect for providing portable instant shade at sporting events, backyard bbqs, tailgate parties, the beach and much more. 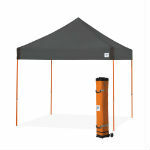 E-Z Up portable instant shelters provide maximum shade and UV protection. The 150 denair heavy duty vinyl top provides protection from up to 99% of the sun's harmful UV rays. 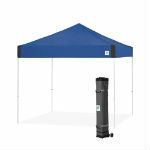 The durable EZ Up Envoy 10 x 10 straight leg canopy is perfect for sporting events, street fairs, farmers markets, craft fairs or wherever you need a portable shade structure. The EZ Up Swift is light weight for on the go portable shade. All of our EZ Up Quik shade canopies include ground stakes and a rolling wheeled nylon carrying bag for easy storage and transportation. In addition, they are backed by a one (1) year limited manufacturer's warranty. This is why our backyard shade structures consistently receive the best customer reviews.